Rosemary essential oil is steam distilled from the flowering tips of the rosemarinus officinalis herb which often grows by the sea. It is believed to have been used in funeral rites since Roman times. Very popular in modern day cooking, this wonderful herb also has a place in bath and body applications, such as essential oil scent blends used in handmade soap. Often used for dry and mature skin, wrinkles, acne, dandruff, eczema, headaches and as an effective insect repellent. A great addition to a handmade shampoo bar as it cleans oily hair very well. Usually clear to pale yellow in colour and has a strong, fresh, woody herbal scent. 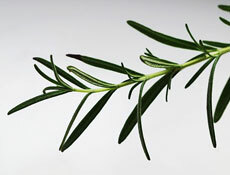 Is said to stimulate hair growth, cell renewal and reduce the appearance of varicose veins. Is generally non-toxic but is not suitable for epileptics, those with hypertension and pregnant women. Blends well with citrus oils, herbal oils, lavender, eucalyptus, cinnamon, citronella, pine, pepper, peppermint, bergamot, ginger, cedarwood, petitgrain, tea tree and frankincense.